CoD:WaW Nazi Zombie Hex editing for dummies! Discussion in 'Call of Duty: WaW Modding' started by Shadow Heir1, Jun 29, 2009 with 48 replies and 15,737 views. 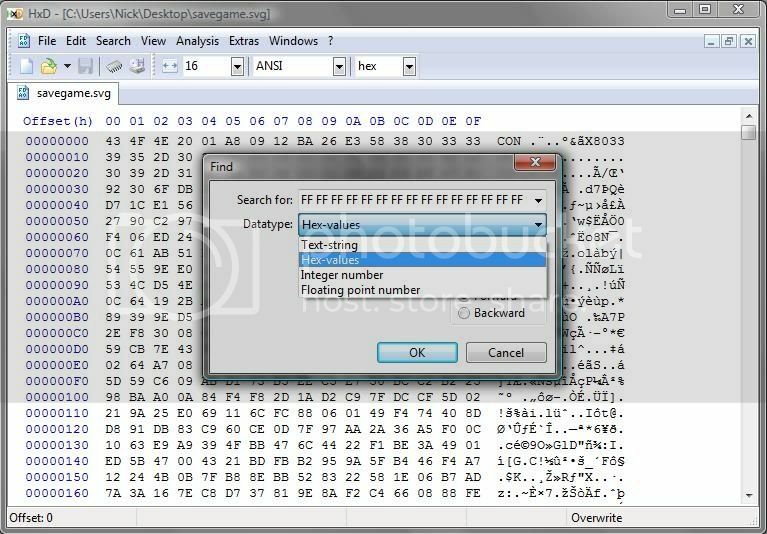 Hex editing your savegame.svg is a pretty simple process that can compliment CoDtool perfectly. Start WaW and select your HDD as your save device. Go into solo and start the mission you want to cheat on (If zombies, just stick with Semper Fi, it is the only one that I have tested, if you know for sure that other levels work, you may use them, but I am only recommending the level that I know works), press Start, and Save and Exit. Turn off your Xbox and take out your HDD. Hook it up to your computer and open it in Xport, Xplorer, or what ever you use to extract. Open partition 3 -> content -> your profile -> CoD:WaW -> 00000001 (or whatever it is). 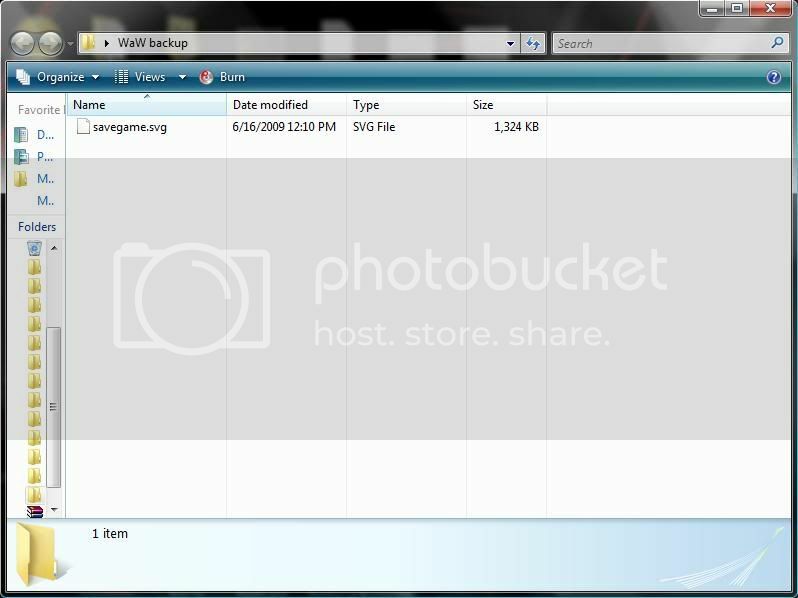 Then, extract your savegame.svg to your desktop (or wherever you want it to be), open a separate folder (preferably .zip or .rar), and put a copy of your savegame.svg in there, as a backup. Open HxD, in the top-left click File -> Open, and select your savegame.svg. Press Ctrl+F, press the drop box, select hex values, type in FF FF FF FF FF FF FF FF FF FF FF FF FF and press OK.
Click at the first "y" looking thing, then type "....perk_armorVest....999" (If you make a mistake, DO NOT BACKSPACE!!! Just click in front of the mistake and type over it. Now, make sure that for both sets of periods you use 4 periods, this is required, do not leave it out. Then look at the left side and change the first periods of each set of periods to 00 instead of 2E (in HxD start at the red values in the hex, this just makes it easier to see where to start.) The 4th period is dependent on the length of the string after it. (perk_armorVest is 14 digits, so use the hex value corresponding with the dec value "14" as according to this chart, which is 0E.) So the period before 999 would be 03. Once these changes are made, go to File -> Save. Open the newly modded savegame.svg in your resigner of choice and resign it. I prefer CONcept. Open your HDD extraction program (if you closed it), navigate back to where you got your savegame.svg, either drag it back into the folder or press Edit -> Insert File, and browse to your modded savegame.svg. Disconnect your HDD and reconnect it to your Xbox. Start it up and play WaW. When it loads, select HDD as your save device and go to Solo -> Resume game. When it starts press Start -> Save and Exit. Now either A: Press mission select and choose Nazi Zombies -> Your map of choice, or B: Go into Co-op (private match with close friends if you don't want to get in trouble) and choose your map of choice. To get the cheat to work, simply get the Juggernog perk (Verruckt or Shi No Numa). You can now sustain much more damage than normal. This is friggin mint guy!! Thanks again for posting here!!! There is a special value that enables you to take practically infinite hits from a single zombie. But if you get swarmed, the game recognizes that you should be dead, so it kills you XD. And Infinite health does NOT work on zombies because it runs a check. Maybe if you played without the patches it might work. Also i managed to get hold of CodTool 1.5 beta 2 (which i could upload if anybody wants it) which does not block out Perk_armorVest. Don't post Beta 2. Cheater912 (guy who made the program) is super-pissed that it got leaked already. If it were posted on Se7ensins, his head would explode cared:. Psssshhh. He doesn't care. A new CoDTool v1.5 Beta 4 was released to the beta testers. Let's just say that it is truly awesome! 1.5 was posted, and I deleted it. Do not post it again, until it is ok'd. thanks. What if you want more than one mod? How would you space them out? Just skip one ? :? Please free at least 5mb of free space on game drive. You did it wrong. Lol try it again and make sure to resign. looks different to me...and I asked for him to post it here....thank you. I submitted it to ModdedWarfare...I mentioned that at the bottom. I am Nikolai Reznov at Modded Warfare. My tutorial was posted the day before yours lol... Epic fail, GTFO!